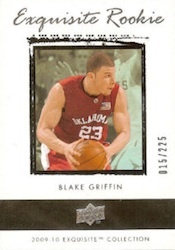 Blake Griffin cards had all the makings of an epic failure for collectors. Although he excelled during his two seasons at the University of Oklahoma and was rewarded as the number one overall selection by the Los Angeles Clippers, an early injury took away his true rookie season. Comparisons were quickly made to another former top pick with injury issues, Greg Oden. Collectors were understandably concerned with a player who not only missed an entire season, but also played for the LA Clippers, which, until recently, was a hobby wasteland. Almost all those doubts were erased during the 2010-11 season and Blake Griffin cards and memorabilia prices haven't been the same. Still considered a rookie by the league, Griffin certainly did not play like one. 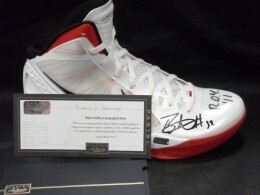 The value of Blake Griffin cards and memorabilia exploded as he ran away with the Rookie of the Year honors. He was also named the Slam Dunk champion. With a considerable amount of young talent around him and a growing fanbase, Griffin is primed to push his hobby standing to great heights. Griffin has also increased his recognition with his participation in several "Funny or Die" sketches that showcased his humor and charisma. Although these opportunities are not enough to sustain values for a player that is not producing on the court, they can serve as catalyst for a rapid ascension into elite status generally reserved for the likes of Kobe Bryant and LeBron James. 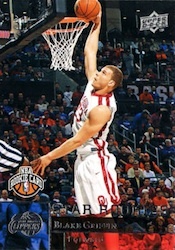 As a result, Blake Griffin cards have a tremendous upside. Blake Griffin is one of a handful of top Panini exclusives and should remain a cornerstone of the brand. Because of this and his young age, Griffin should continue to be a hobby mainstay and elite collecting option. 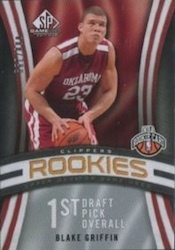 There are 28 Blake Griffin cards that fall into rookie card status, covering all price ranges. The top three Blake Griffin cards can be seen below. National Treasures is a high-end product from Panini that carries a lot of weight in the hobby. 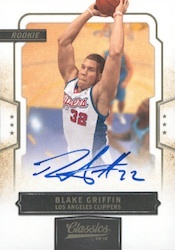 Understandably, when Blake Griffin emerged as an elite player, these cards were the top choice for many collectors. The large jersey patch, on-card autograph and miniscule 99-card print run make it the top choice of all Blake Griffin cards. Although it is not an autographed card, the Exquisite rookie of Blake Griffin is still highly sought after. Numbered to 225, the card is almost underwhelming based on its simple design and high price tag. It would have been interesting to see the two heavyweights, Exquisite and National Treasures, go head-to-head with autographed versions for the ultimate basketball showdown. However, Grffin's exclusive deal with Panini prevented him from signing cards for Upper Deck Exquisite. This is still one of the top Blake Griffin cards to own. 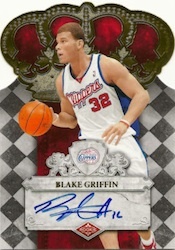 The popular Crown Royale die-cut design combined with an on-card auto and decent print run of 299 make this a solid rookie to pursue if you are looking for a top Blake Griffin rookie card that won't cost you more than a month's rent. 09-10 Donruss Elite Blake Griffin Rookie Autograph Card #249 499! 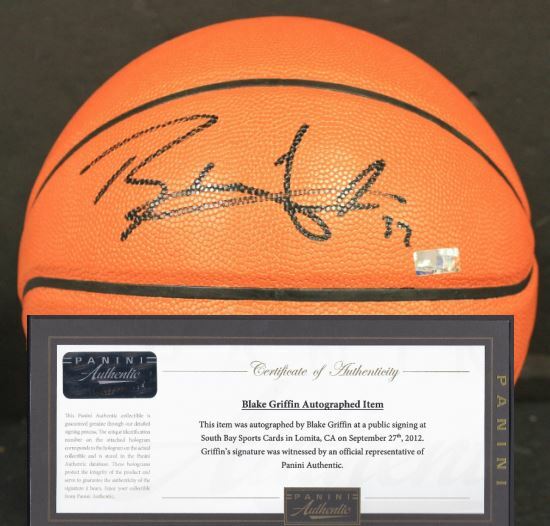 In this section, you will find examples of what an authentic Blake Griffin autograph looks like. This can be used as a first point of reference for determining the legitimacy of autograph memorabilia, but is not a substitute for having your items authenticated by a well-respected professional autograph authentication company. 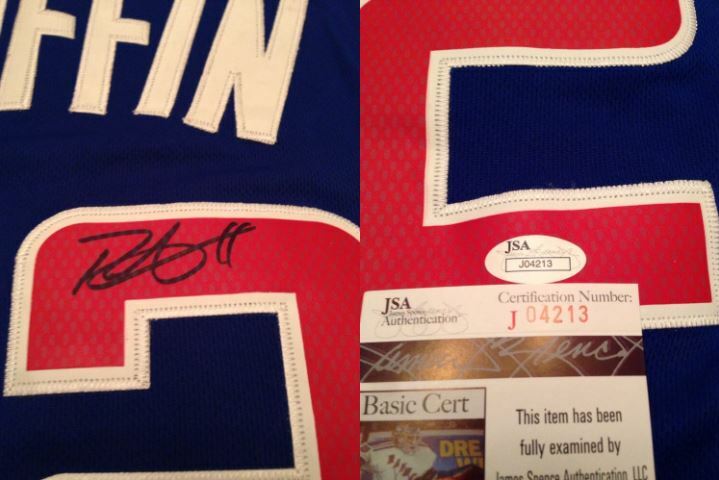 Reputable authentication companies include JSA, PSA, Panini Authentic, Tristar and Mounted Memories to name a few. Click on any of the images below to view full size photos. The whole signature is written on a level horizontal plane. The letter "B" consists of two pen strokes, on of a back line at at 60 degree angle, the other forming the "B" loops, neith of which are closed. The end of the letter "B" flows into a legible letter "l."
The remaining letters of the signature are convolute, with a line, just less than 45 degrees crosses the connection point of the looping letter "l", coming of the the letter "B" at the bottom, and extending to cross two parallel lines possibly representing the letters "ff." Griffin often inscribes his autograph with his jersey number "12." BLAKE GRIFFIN SIGNED AUTOGRAPHED PANINI 2012 13 LIMITED EDITION CARD EXCELLENT! 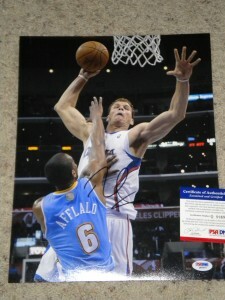 BLAKE GRIFFIN LOS ANGELES CLIPPERS SIGNED Blue Jersey JSA NBA ALL STAR!! 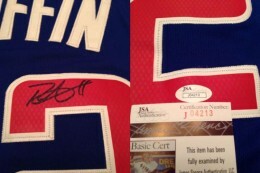 BLAKE GRIFFIN LOS ANGELES CLIPPERS SIGNED Red Jersey JSA NBA ALL STAR! !